Join Stamford University, Simmons College and dozens of High Schools in the San Francisco Bay Area by participating in this important Pilot Program. Helping students develop critical thinking skills is one of the greatest educational and civic challenges of the 21st Century. 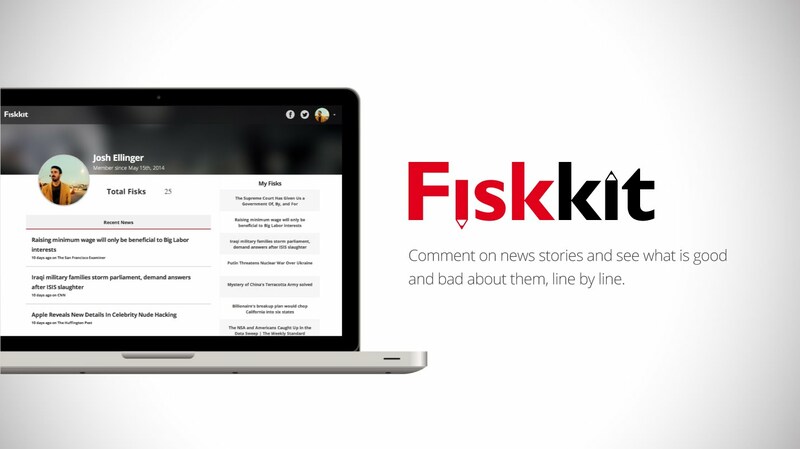 Fiskkit.com is a startup dedicated to elevating public discourse through critical and respectful analysis of online news articles. In the educational environment, Fiskkit allows students to practice critical thinking and educators to measure and track students’ critical thinking skills over time. We are seeking educators interested in testing this new innovative tool in their classrooms. Fiskkit is the online version of marking up an article with a red pen. Fiskkit allows students to comment on individual sentences in an article and tag them as True or False (or Opinion), logical fallacies like Overgeneralization or Cherry Picking, other flaws like Unsupported or Biased Wording, or compliments like Insightful and Well-Researched. This methodology can be used to train students to think critically about the content they read. Practicing it over a period of time creates the “muscle memory” to engage in critical thinking over a lifetime. To demonstrate that students learn by doing critical thinking, we are making a private version of Fiskkit.com available for instructors to use in the classroom to add focus and (accountable) preparation to classroom discussion of articles the teacher selects. Sign-up for the free pilot program here. How Does Fiskkit Work in the Classroom? Fiskkit was designed from the ground up for analytics – to find insights in regular people’s thinking. As the system captures the judgment of each commenter, it runs a sophisticated test of significance to determine if any particular tags can be statistically validated. It then shows only those tags on an “Insight” page. This is a great starting point for a classroom discussion of the article. Moreover, we can measure (albeit imperfectly) a student’s critical thinking by what percentage of the tags they apply get statistically validated by the system (and/or by the teacher’s own fisk). Over time, we should see those percentages rise as students become more familiar with the concepts and learn to recognize flaws in an argument. Join Stamford University, Simmons College and dozens of High Schools in the San Francisco Bay Area by participating! Previous How to use ‘Green Screen’ / ‘Chroma Key’ tech to look inside the human body! I’m in! Just signed up. Do we know when the pilot starts? Hi Christine! John from Fiskkit here! The pilot should be available as early as next week. Shoot us an email to contact@fiskkit.com and we will run you through a quick tutorial and you’ll be all set to use it in your classroom! Have you got any ideas for Valentines Day? Like making a simple card or something. What do you suggest? ?